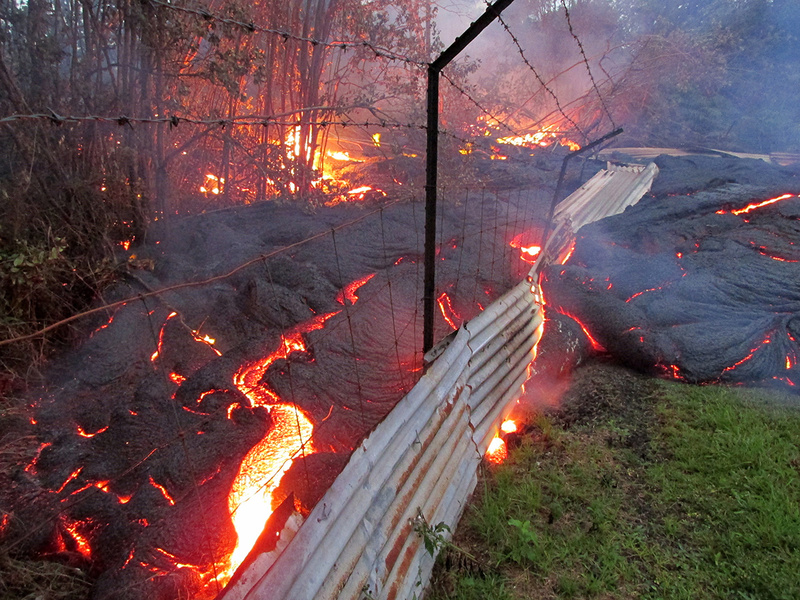 The slow burn in Hawaii: Lava from a lobe in the forest below the P?hoa, Hi., cemetery burst past a property-line fence on Fri., Oct 31, 2014. Rock is flowing once again on Hawaii’s big island, where geologic change is not a matter of centuries and millennia, but rather of hours and days. Every square inch of these Hawaiian islands owes its existence to a hot spot that conduits molten rock from deep inside Earth to the surface. Pelé, the god of the volcano, is a hungry god, and as volcano Kilauea oozes red-hot rock, the village of Pahoa watches the lava push closer. Families on the volcano side of town have already packed for evacuation if necessary. Volcanoes can do much worse than ooze into the backyard and seize territory. On Sept. 27, Ontake, Japan’s second-tallest volcano, erupted without warning, killing at least 56 in that island nation’s worst volcanic tragedy since 1902. Earthquakes, caused by the movement of molten rock, or magma, usually precede eruptions, but little magma moved before the steam explosion at Ontake, so the government issued no warning. September 27, 2014: white smoke rising from Mount Ontake as the volcano erupts in Nagano prefecture, central Japan. The unexpected eruption killed at least 56 people at the popular hiking spot. Kilauea’s rock chemistry is not conducive to explosive eruptions, and more inclined to slow-moving oozes. You can walk up to the molten lava. As the cherry-red surface cools to a brittle, glassy, black rock, you hear the unforgettable crinkly, crackly noise of a planet changing shape. The rare opportunity to watch terra firma forming in Hawaii is misleading: most of the planet’s crust was once rock — magma — that emerged from the deeps and cooled million or billions of years ago. Some estimates say that 80 percent Earth’s cold, hard surface originated as molten rock. Volcanoes are awesome reminders that Earth is not a boring, static hunk of rock, but rather a living planet that coalesced from a hot cloud of gas and dust about 4.5 billion years ago. The skin cooled as heat from the surface radiated to space. But the high-temperature rock inside was insulated by the crust, and actually has gained heat from radioactive decay and gravitational energy. In short, we’re sitting on a ball of fiery rock wrapped in a dozen kilometers or two of cool rock. That’s unstable. Heat rises. Hot substances are less dense than colder ones, so magma is always looking for an escape hatch through the crust. And since heat is a form of energy, rising magma brings up oodles of energy — enough to power cataclysmic explosions. Enough to reshape the face of the planet. * water-rich ocean crust is subducted into much hotter mantle rocks at the edges of tectonic plates. To understand volcanoes, you need to know the Ring of Fire, where most of them are located. The Ring is located where tectonic plates meet and denser ocean crust sinks beneath the lighter continental crust. That’s the process of subduction, and it’s the major source of magma. Most volcanoes are in the “Ring of Fire” around the perimeter of the Pacific Ocean. 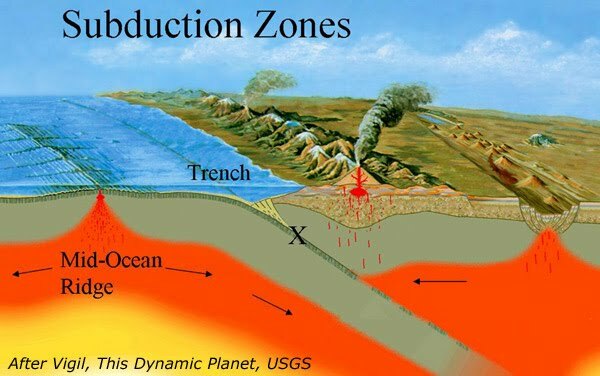 At subduction zones, the oceanic slab sinks below the continent, bringing water and rock to the mantle and powering volcanoes. Ocean floors form when massive outflows of lava at the mid-oceanic ridges solidify and spread. The ocean floors act as slow-motion conveyor belts, moving toward the continents, where they dive underground and disappear. Strings of volcanoes in the Andes, Cascades, Aleutians and so on across the Ring of Fire mark the subduction zones. The mantle rock melts, and becomes less dense than surrounding rocks, so they rise through the surrounding solid mantle by convection, eventually reaching a magma chamber a few kilometers below the volcanic vent. As the magma continues rising, falling pressure liberates high-pressure gas that was trapped inside it, vapor bubbles expand and eventually rupture, and the volcano can erupt explosively. 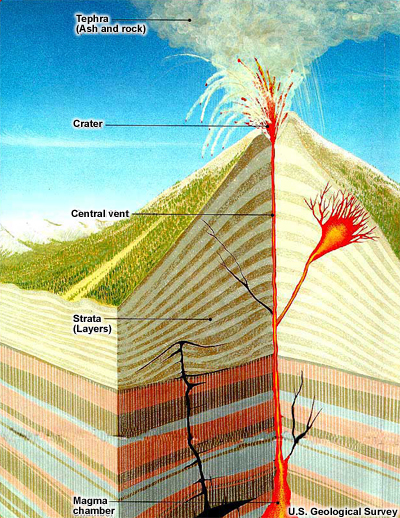 Volcano structure is dependent on the geologic setting and chemistry of the emerging magma. Villarrica, in the Southern Andes in Chile, is one of the few volcanoes with an active lava lake in its crater summit. Composite volcanoes are built of alternating layers of ash and lava. These so-called stratovolcanoes, including Mt. Fuji in Japan, Vesuvius and Stromboli in Italy, and Villarrica in Chile, fulfill the stereotypical volcanic cone. Shield volcanoes are born from multiple vents that emit flowing (not exploding) lava. Mauna Loa on Hawaii, standing 10 kilometers from ocean floor to summit, is a classic shield volcano. Shield volcanoes typically form over an oceanic hot spot, not at a subduction zone. A lava dome is built by eruptions of viscous, non-explosive andesitic or dacitic lava. A cinder cone is built from basaltic ash and lapilli — sand to golf-ball-sized ballistic fragments that pile up around a volcanic vent. A caldera is a ring-shaped depression surrounded by steep cliffs. A caldera forms when a magma chamber spews out its molten rock, and the mountain above it collapses. All volcanoes, in one way or another, represent a leak in the Earth’s crust that allows magma to ooze or burst out. Many types of rock can be released, and some flows can threaten locations so distant that the volcano is just innocuous scenery at the horizon. At center, Domo Maule is a dome built of dacitic lava more than 100,000 years ago. Arrow points to reddish rhyodacite lava flow that wrapped around the Domo and flowed into Laguna del Maule, Chile, in the past few thousand years. Mt. Bromo, Java, Indonesia smolders in the foreground, with Mt. Semeru in back. 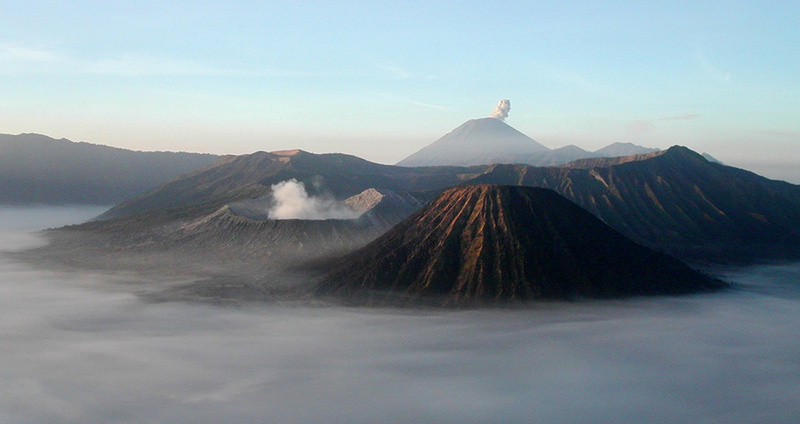 Bromo’s caldera (note wall at left) encloses several younger, daughter cones. The mineral composition of molten rock determines its eruptive behavior. Higher silica content allows a rock to trap more water and forms the most explosive lava. As rising populations run out of safe places to live in volcano country, sooner or later volcanoes will write headlines of havoc. The dying was already under way 2,000 years ago, when Mt. Vesuvius erupted and buried Pompeii in 79 CE. Today, three million people in Naples, Italy, live in the shadow of Vesuvius. Plenty of other cities face grave volcanic threats. At the western edge of the Ring of Fire, for example, densely crowded Japan, Philippines and Indonesia are all studded with active volcanoes. For example, Mexico City, the world’s largest metropolis, is just 55 kilometers from Popocatépetl, a 5,465-meter giant that’s erupted about 17 times since Columbus “discovered” the New World. Mt. 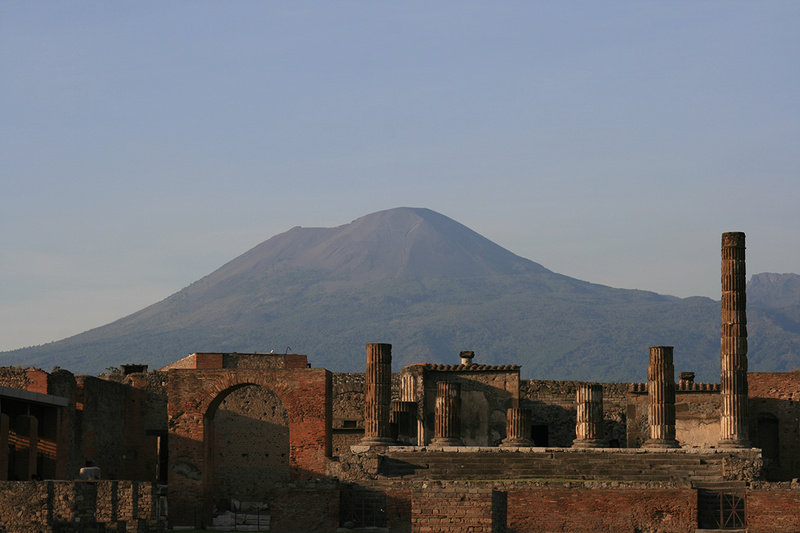 Vesuvius, destroyer of Pompeii (whose ruins appear in foreground), poses a grievous threat to Naples. For perspective, eruptions like Mount St. Helens, which emitted one cubic kilometer of ash in 1980, happen every decade or so. Krakatau, Indonesia, 1883, put out about 20 times as much stuff. Such event is expectable roughly once in a century. But consider the 3,000-cubic-kilometer eruption about 75,000 years ago of Mount Toba (also in Indonesia), which likely affected the global climate for years. These volcanic “super-eruptions” can effect the climate and economy of an entire hemisphere, yet we have no human experience of what signals volcanoes might emit before such mega-eruptions. It’s a principle of geology: What happened before can happen again. So get this straight. Gargantuan eruptions are rare. But gargantuan eruptions can happen. 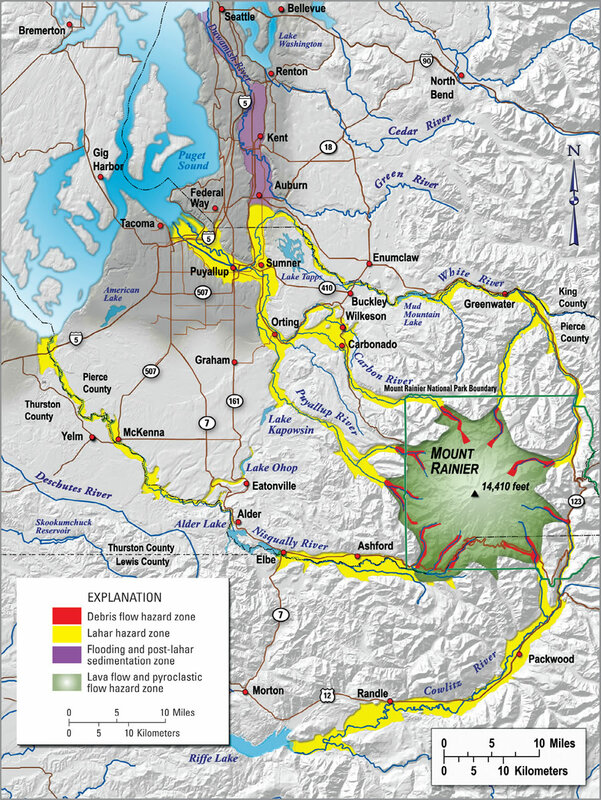 If the past repeats itself, these areas near Seattle, Wash., could be affected by debris flows, lahars, lava flows or pyroclastic flows from majestic Mount Rainier. Large igneous provinces — the volcano’s big brother! If a volcano is like a pinhole in Earth’s crust, a “large igneous province” ensues when you take a machete to Earth’s cold, fragile skin. Many times in Earth-history, long cracks in the crust have gushed red with lava, producing “flood basalts” that may, for all we know, have flowed for centuries. The Siberian traps (shown here at the Putorana plateau) cover about 1.5 million square kilometers. Other flood basalts cover the Columbia Plateau. Canada’s Mackenzie Large Igneous Province covers 2.7 million square kilometers. A big volcano can affect weather for years. What would be the atmospheric outcome of upheaval on this scale? Volcanoes are fascinating in their own right, but the big money is trying to anticipate, even predict, eruptions. The record is spotty, as emphasized by Ontake’s unexpected and deadly eruption on Sept. 27, but steady progress in understanding the chemistry and dynamics of volcanoes should improve matters. 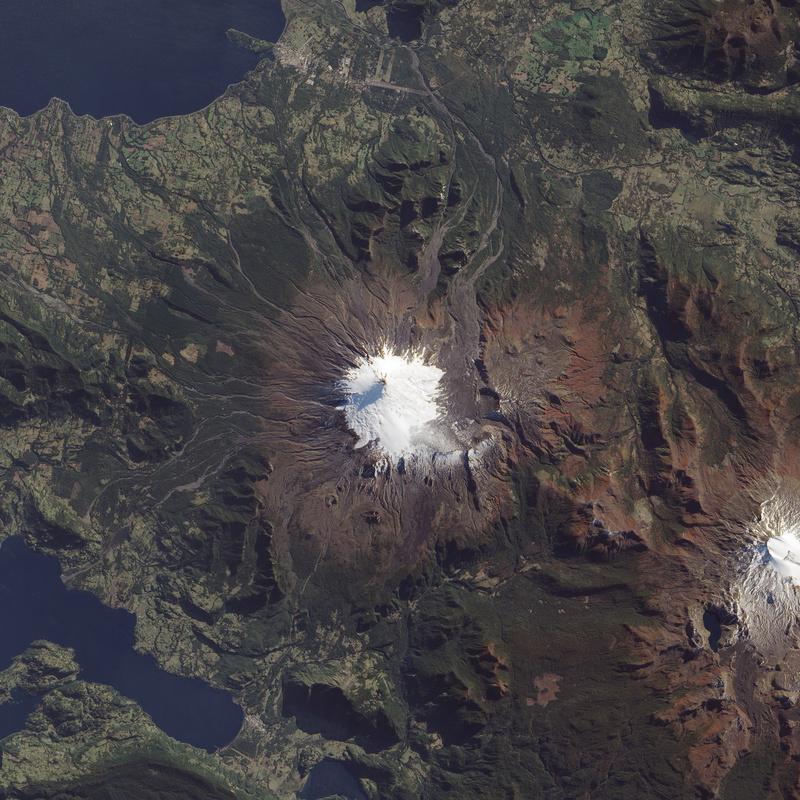 * Geologic history: How regular and frequent were this volcano’s past eruptions? Based on the composition of the erupted magma, how explosive were the eruptions? How did past eruptions change the landscape? How far away were the effects felt? * Deformation of Earth’s surface: Before eruption, rising magma may change the surface above the magma chamber. Broad deformation indicates deep magma, while more focused deformation signifies shallow magma that may be more likely to erupt in the near future. * Gas emissions: Rising magma releases gases like water, carbon dioxide and sulfur dioxide. The timing and intensity of these gases hints at the magma’s composition and location. * Chemical and physical structure of the magma: Scientists are fascinated by crystals present in a “mush” in some magma reservoirs capable of super-eruptions. If the crystals vanish or change composition, could that trigger an eruption? * Earthquakes: Rising magma must bust through rock, and the resulting quakes may be the best single indication of magma movement and near-term eruption. * Gravity: Magma is hotter, and therefore, less dense than the same rock at lower temperatures. * Electrical conductivity: Changes in underground electrical conductivity can reveal the presence of hot water or molten rock at shallow depths. 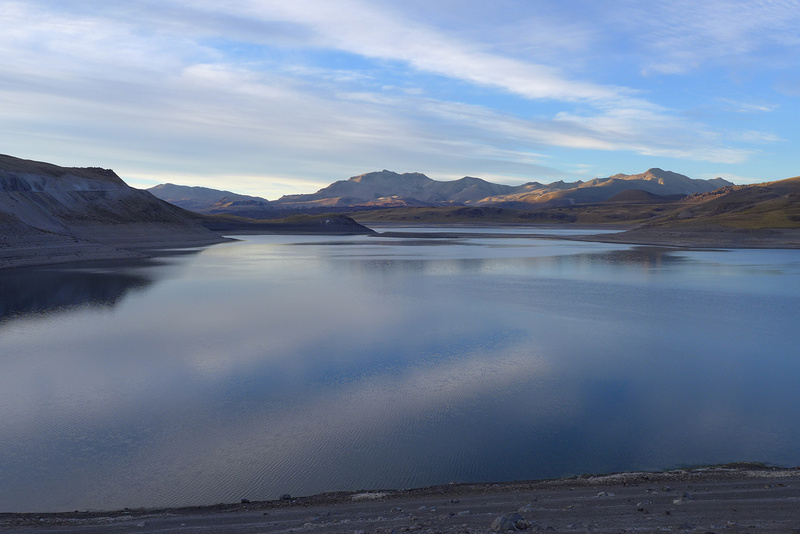 Laguna del Maule, a volcanic complex in the Southern Andes, is the result of about 20 millennia of intense volcanic action. This land surface here is rising faster than any place on Earth — about 25 centimeters per year. A full-bore scientific investigation here showcases the techniques that can be used to understand what the volcano is doing. In the past, this volcanic field has produced eruptions many times larger than Krakatau, and capable of devastating large parts of Chile, Argentina, and the downwind southern hemisphere including Australia and New Zealand. The 2011 eruption of Cordon Caulle in Chile (at 41° S latitude), closed airports in Brisbane, Sydney, Melbourne, Auckland and Buenos Aires. On a field of broken igneous rock, University of Wisconsin-Madison geophysicists set up a station to measure gravity. 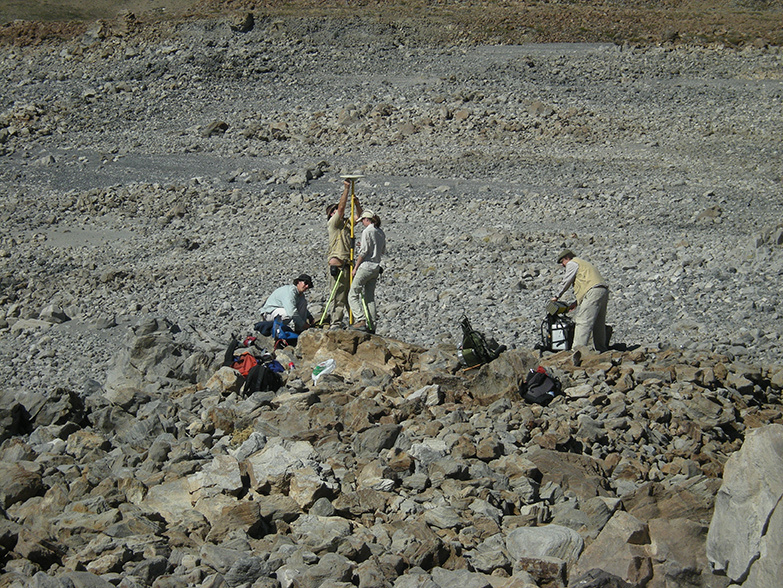 The satellite dish feeds a high-precision GPS instrument that measures the altitude of a reference rock, which will hold an ultra-sensitive instrument to measure gravity. A change in gravity indicates a change in rock density underground, a clue that magma is rising. Although scientists do not claim that the volcano prediction problem is near solution, some incremental gains are evident. In 1991, for example, the lessons of Mount St. Helens were tested when the ground began shaking around Mount Pinatubo in the Philippines. A collaboration of U.S. and Filipino volcanologists watched, waited, and eventually made an accurate warning. The Philippine government evacuated tens of thousands of residents, saving massive casualties. Although gigantic mud flows and ash deposits lead to the closing of two major U.S. military bases, few lives were lost during the largest eruption of the 20th century. 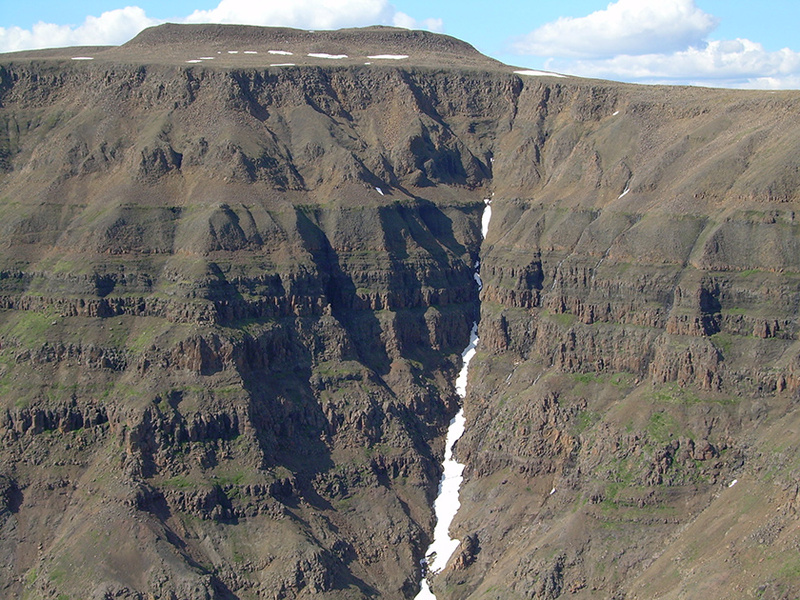 Will the 2010 volcanic eruption in Iceland lead to a change in global weather patterns? Did a volcanic eruption in Alaska impact weather in the Midwest?